Some Helpful Information From H&H Auto On Testing Your Classic Car Instruments! CLICK ON AND SEE THE TACHMAN'S ARCHIVE OF HOOK UP\WIRING DIAGRAMS, DRAWINGS AND USEFUL NOTES ! Need help hooking up your Ford/Mustang tach? Click on the link below and print. www.tachman.com/fordhkp.htm PLEASE NOTE: BALLAST RESISTORS ARE NO LONGER AVAILABLE FROM YOU LOCAL PARTS STORES. TRY WWW.JEGS.COM OR CALL THEM TOLL FREE AT 1-800-345-4545! CHECKING YOUR MUSTANG/FORD IN LINE TACHOMETER! WARNING: NEVER ALLOW YOUR TACHOMETER TO GET AROUND METAL PARTICLES ON A DIRTY WORK BENCH! THE METER MOVEMENT WILL GET CONTAMINATED, CAUSING THE NEEDLE TO STICK. THIS WILL PREVENT NASTY PROBLEMS, BUT I CAN SOLVE IT. TO LEARN MORE ABOUT THE DIFFERENT TYPES OF METERS SCROLL DOWN THE PAGE! MUSTANG/FORD TACHOMETERS (MOST 1963-76 FORD, 1965-73 MUSTANG) CAN CAUSE YOUR ENGINE NOT TO START. THE 12 VOLTS TO THE PLUS SIDE OF THE COIL GOES THROUGH THE TACHOMETER ELECTRONIC CIRCUIT THAT CONTAINS A SPECIAL INPUT ISOLATION TRANSFORMER. IF THE PRIMARY OF THE TRANSFORMER IS BURNED UP OR OPEN NO VOLTAGE AND THE RESULTING CURRENT FLOW WILL GET TO THE PLUS SIDE OF THE COIL. THEREFORE YOUR ENGINE WILL NOT START. THE CIRCUIT ON THE BLACK WIRE SIDE OF THE TACH GOING TO THE COIL ALSO CONTAINS A CALIBRATED BALLAST RESISTANCE BEFORE IT GETS TO THE PLUS SIDE OF THE COIL. THIS CALIBRATED RESISTANCE WIRE IS 1.5 OHMS. THE BALLAST RESISTANCE WIRE IS MADE OF TUNGSTEN TO WITH STAND HEAT. NEVER CUT THIS WIRE AS IT CAN'T BE RESTORED IN ANY WAY. THE BEST WAY TO CHECK THIS IS TO INSTALL A KNOWN GOOD TACHOMETER AND SEE IF THE ENGINE WILL START. ANOTHER WAY IS TO FIND A GOOD VOLT-OHM METER AND SELECT THE OHMS R TIMES 1 SCALE AND MEASURE ACROSS THE 2 LEADS COMING OUT OF THE TACH. IF THE METER READS OPEN OR NO RESISTANCE AT ALL, THEN THE TACH'S INTERNAL ELECTRONIC CIRCUIT IS DEFECTIVE. IF THE TACH LEADS READ AROUND 1 OHM OR SO AND THE CAR STARTS, BUT THE TACH STILL DOES NOT WORK, THEN THE TACH METER OR ELECTRONIC CIRCUIT STILL NEEDS REPAIR. IF YOU NEED TO SEND YOUR TACH TO US FOR REPAIR, YOU CAN REMOVE THE MALE AND FEMALE BANANA PLUGS FROM YOUR TACH LEADS AND JUMPER THEM TOGETHER. THE ENGINE WILL RUN WITH THE TACH OUT OF THE CIRCUIT WHILE IT IS BEING SERVICED. SINCE H&H AUTO IS AUTHORIZED FORD/MUSTANG SERVICE, WE CAN REPAIR THESE TACH'S QUICKLY AND AT AN AFFORDABLE PRICE. CALL H&H AUTO AT 864 895 4404 OR EMAIL US AT tachman@bellsouth.net AND WE WILL REPAIR YOUR FORD TACHOMETER. ANY PARTS INSTALLED BY THE TACHMAN CARRY A 2 YEAR WARRANTY WITH EXPERT TECH ASSISTANCE! NOTE: TACHMAN CAN NOW CONVERT YOUR FORD TACHOMETER TO 3 WIRE! FOR MORE INFORMATION CLICK ON FOR MORE INFORMATION! UNDERSTANDING BALLAST RESISTANCE A BALLAST RESISTOR IS ACTUALLY A CURRENT LIMITING DEVICE THAT HAS A VOLTAGE DROP. EVEN THOUGH WITH THE CAR RUNNING, YOUR ALTERNATOR IS PUTTING OUT AROUND 13.8 VOLTS, THE VOLTAGE ACTUALLY GETTING TO THE PLUS SIDE OF THE COIL IS AROUND 8-10 VOLTS. WHY? BECAUSE WE ARE USING A DC CURRENT HERE AND IF NO BALLAST RESISTOR IS IN THE CIRCUIT TO THE COIL YOUR ENGINE WILL START RUNNING VERY ROUGH IN ABOUT 30 SECONDS. THE COIL MAY FRY AND THE ELECTRONIC CIRCUIT IN THE FORD/MUSTANG IN LINE TACH WILL START SMOKING VERY QUICKLY. A/C (ALTERNATING CURRENT) VOLTAGE IS A SINUSOIDAL WAVE FORM THAT GOES ABOVE AND BELOW THE 0 TIME LINE AXIS. WHEN THE SINE WAVE GOES PLUS 180 DEGREES HEAT IS GENERATED AND WHEN THE SINE WAVE GOES 180 DEGREES BELOW THE 0 AXIS LINE A COOLING PROCESS OCCURS. WITH DC OR DIRECT CURRENT THIS DOES NOT HAPPEN, THUS THE NEED FOR A BALLAST RESISTOR. WHETHER IT'S FORD/MUSTANG THAT CONNECTS TO THE PLUS SIDE OF THE COIL OR GM/MOPAR THAT CONNECTS TO THE MINUS SIDE OF THE COIL. A BALLAST RESISTOR MUST BE USED BECAUSE IT LIMITS CURRENT WHICH PRODUCES THE AFOREMENTIONED VOLTAGE DROP SO YOUR COIL DOES NOT HEAT UP AND YOUR ENGINE RUNS CORRECTLY. NOTE: SINCE A FORD/MUSTANG TACHOMETER IS IN LINE WITH THE PLUS SIDE OF THE COIL, DOUBLING THE BALLAST RESISTANCE, 3 OHMS PER SAY, WILL MAKE THE TACH READ HALF. IF YOU ARE EXPERIENCING THIS SITUATION WITH YOUR FORD/MUSTANG TACHOMETER READING HALF, CHECK TO MAKE SURE YOU ONLY HAVE 1.5 OHMS OF BALLAST RESISTANCE! IMPORTANT INFORMATION ABOUT METER MOVEMENTS USED IN YOUR CLASSIC CAR OR TRUCK TACHOMETER! HERE ARE THE BASICS ABOUT METER MOVEMENTS IN YOUR CLASSIC AUTO OR TRUCK TACHOMETER. METER MOVEMENTS ARE THE INSTRUMENT THAT MOVES TO INDICATION ENGINE R.P.M'S IN YOUR TACHOMETER. THERE ARE 3 TYPES: D'ARSENVAL, TAUT-BAND AND BI-COIL. TAUT-BAND AND D'ARSENVAL MOVEMENTS ARE LIKE A SMALL MOTOR WITH AN ARMATURE AND FIELD COILS. TAUT-BAND METERS HAVE A PEG STICKING UP AT ZERO THAT THE POINTER RESTS ON WHEN THE ENGINE IS CUT OFF. THEY ARE MADE OF PLASTIC AND ARE EASILY BROKEN IF NOT HANDLED PROPERLY. D'ARESENVAL METERS WERE USED IN 90% OF THE CLASSIC CAR ERA TACHOMETERS. THERE IS NO PEG AT ZERO AND THEY WILL GO TO ZERO, POSSIBLY DROP BELOW ZERO AND RETURN TO ZERO WHEN THE ENGINE IS CUT OFF. BI-COIL METERS ARE WOUND SOMEWHAT LIKE A G.M. TEMPERATURE GAUGE AND ONLY GO TO ZERO RPM WHEN THE ENGINE IS TURN ON. BI-COIL METERS ARE STILL READILY AVAILABLE. HOWEVER, D'ARSENVAL AND TAUT BAND METERS ARE EXPENSIVE AND HARD TO FIND, EASILY DAMAGED AND SUBJECT TO BEING CONTAMINATED BY ANY METAL SHAVINGS! 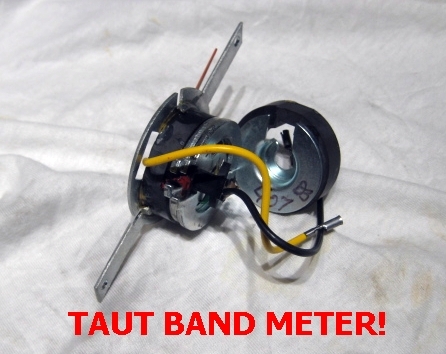 HERE IS WHAT A TAUT BAND METER LOOKS LIKE. ALREADY IN PIECES! THE TAUT BAND METER IS USED ON 1968-1970 AMC, 1971-1973 MUSTANG, 1971 UP FORD TACHOMETERS. THE METER WAS A VERY CHEAP, JUNK FACTORY UNIT. SINCE MOST OF THESE TAUT BAND METERS ARE 40 YEARS OLD THEY WILL STICK AND COME APART LIKE THE ABOVE PICTURE. THIS IS WAY TACHMAN WILL RECOMMEND YOUR TAUT BAND TACHOMETER BE UPGRADED TO 3 WIRE TO WITH A 6 YEAR WARRANTY. HOPE THIS HELPS EXPLAINS THE JUNK AMC AND FORD INSTALLED IN THERE FACTORY TACHOMETERS!!! THE FACTS! H&H AUTO HAS BEEN RESTORING CLASSIC CAR INSTRUMENTS SINCE 1979 AND KNOWS ALL THE IN'S AND OUT'S OF THE DIFFERENT TYPES OF METER MOVEMENTS USED TO PRODUCE YOUR CLASSIC CAR OR TRUCK TACHOMETER. WHETHER IT'S FORD, G.M., AMC OR MOPAR, H&H AUTO KNOWS HOW TO HANDLE, CALIBRATE, BALANCE AND REPLACE YOUR CLASSIC CAR OR TRUCK TACHOMETER METER. MANY OF THE METERS, NAMELY THE D'ARSENVAL AND TAUT-BAND METES ARE GETTING VERY HARD TO FIND. 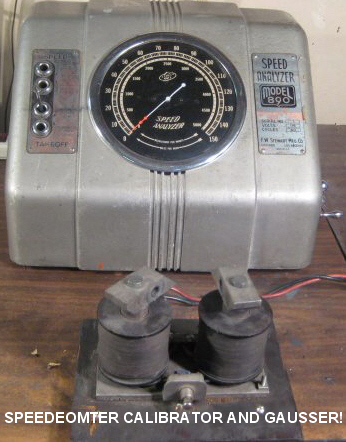 TACHMAN HAS HAD FACTORY TRAINING ON HOW TO PROPERLY HANDLE, BALANCE AND RESTORE CLASSIC CAR AND TRUCK METERS. I HOPE THIS INFORMATION HELPS ANSWER YOUR QUESTIONS ABOUT THE METER MOVEMENTS IN YOUR CLASSIC CAR OR TRUCK TACHOMETERS. 1963 UP FORD, MOPAR AND GENERAL MOTORS SPEEDOMETER CHECKOUT! FIRST, THIS WARNING: NEVER ALLOW YOUR SPEEDOMETER TO GET AROUND ANY METAL PARTICLES ON A DIRTY WORK BENCH. SPEEDOMETERS HAVE MAGNETS AND WHEN AROUND ANY METAL PARTICLES THEY WILL GET INTO THE COIL MAGNET ASSEMBLY CAUSING ERRATIC SPEEDOMETER OPERATION! VERY FRUSTRATING PROBLEM. NOW, LET'S TROUBLE SHOOT YOUR SPEEDOMETER. YOU WILL NEED A REVERSIBLE DRILL (0-2800 R.P.M DRILL IS THE BEST) BECAUSE SPEEDOMETERS TURN COUNTER CLOCKWISE. THERE CAN BE SEVERAL PROBLEMS WITH A CLASSIC CAR SPEEDOMETER. THE CABLE, THE SPEEDOMETER AND THE GEAR IN THE TRANSMISSION, WHETHER AN AUTOMATIC OR MANUAL. TAKE THE CABLE LOOSE FROM THE TRANSMISSION AND CHUCK IT UP TO THE REVERSIBLE DRILL AND HAVE A FRIEND SIT IN THE CAR. POWER UP THE DRILL AND IF THE SPEEDOMETER JUMPS AROUND AND IS UNSTABLE, THE PROBLEM COULD BE THE CABLE OR THE SPEEDOMETER. REPLACE THE CABLE AND IF PROBLEM STILL EXISTS, THE SPEEDOMETER COULD BE THE PROBLEM. TO VERIFY THIS YOU WILL NEED TO PULL THE DASH, REMOVE THE SPEEDOMETER ( YOU WILL NEED TO CUT OFF AN OLD SPEEDO CABLE INSERT END) CHUCK THE END IN THE DRILL AND SEE IF THE SPEEDOMETER IS ERRATIC. IF NOT, IT IS THE CABLE OR THE GEAR IN YOUR TRANSMISSION. IF THE SPEEDOMETER IS ERRATIC WITH THE DRILL MOTOR ATTACHED TO IT OUT OF THE CAR, THE PROBLEM IS THE SPEEDOMETER. YOU CAN THEN SEND THE DEFECTIVE SPEEDOMETER TO H&H AUTO. CALL THE TACHMAN AT 864 895 4404 OR EMAIL US AT tachman@bellsouth.net WITH ANY REPAIR QUESTIONS! BEWARE OF FORD AND GENERAL MOTORS REPRODUCTION CABLES. THE TIP THAT GOES INTO THE SPEEDOMETER IS TOO LONG, DREMEL 1/16 INCH OFF THE TIP!! NOTE: 1970-74 MOPAR E BODY CLASSIC CARS ARE NOTORIOUS ABOUT DEFECTIVE GEARS IN THE TRANSMISSION CAUSING APPARENT SPEEDOMETER PROBLEMS! CHECKING FORD AND MOPAR TEMP, FUEL AND OIL PRESSURE GAUGES DURING THE CLASSIC CAR ERA FORD AND MOPAR GAUGES WHERE PRODUCED USING NI-CHROME WIRE WINDINGS INSIDE THE GAUGE THAT WOULD CAUSE 2 TERMINALS TO EXPAND OR CONTRACT DURING THE GAUGE MONITORING PROCESS. THERE IS ONE BASIC WAY TO CHECK THESE GAUGES. HOWEVER, THIS METHOD IS ONLY ABOUT 90 PERCENT ACCURATE. GET A GOOD VOLT OHM METER AND SWITCH TO THE R TIMES 1 SCALE AND ATTACH YOUR LEADS TO THE 2 STUDS COMING OUT OF THE GAUGE. IT SHOULD READ AROUND 1O OHMS, PLUS OR MINUS AND MOST LIKELY THE GAUGE IS GOOD. HOWEVER, THIS METHOD IS NINETY PERCENT ACCURATE . OTHER FACTORS INCLUDE THE SHAPE OF THE NI-CHROME WIRE WINDINGS IN THE GAUGE ITSELF. ALTERNATOR GAUGES IN FORD AND MOPAR USE A DIFFERENT SETUP AND CAN BE CHECKED BY APPLYING A LARGE D.C. POWER SUPPLY ACROSS THE 2 REAR TERMINALS. WHEN APPLYING 12 OR 13.8 VOLTS ACROSS THE ALT GAUGES 2 REAR TERMINALS (JUST TAP IT OR YOUR TEST LEADS MAY START TO SMOKE:) THE POINTER SHOULD JUMP AND THE ALT GAUGE IS MOST LIKELY GOOD. TACHMAN CAN REPAIR AND CALIBRATE MOST OF THESE GAUGES WITH A 2 YEAR WARRANTY! H&H AUTO CAN ALSO PROVIDE A FREE EVALUATION OF YOUR GAUGES TO MAKE SURE THEY ARE OPERATING PROPERLY. NOTE: MOPAR AND FORD GAUGES WILL DROP BACK TO THE LOW SIDE OF THE GAUGE WHEN POWER IS TURNED OFF. CHECKING GENERAL MOTORS GAUGES CHEVELLE, CAMARO, NOVA, IMPALA, BUICK, OLDSMOBILE, G.M. TRUCKS G.M. GAUGES (INCLUDES MOST CORVETTES) FROM 1965 UP ARE BASICALLY THE SAME AND ARE ENTIRELY DIFFERENT THAN FORD OR MOPAR GAUGES. THE BIG DIFFERENCE IS G.M. GAUGES DO NOT RETURN TO LOW OR ZERO WHEN THE ENGINE IS TURNED OFF. G.M. TEMP, FUEL AND ELECTRIC OIL GAUGES USE 3 OR 4 POLES PROTRUDING FROM THE BACK AND A CALIBRATION RESISTOR THAT MAY BE WIRE WOUND OR A WHITE CERAMIC SLAB WITH DIFFERENT COLORS. IN ORDER TO CHECK THESE GAUGES YOU MUST FIND OUT WHERE THE 12 VOLT, SENDING UNIT AND GROUND POLES ARE. THESE VARY GREATLY FROM YEAR TO YEAR. WHEN YOU LOCATE THEM, GET A GOOD 12 VOLT POWER SUPPLY. THEN PUT THE PLUS 12 VOLT LEAD FROM THE POWER SUPPLY TO THE GAUGES 12 VOLT TERMINAL. APPLY THE GROUND LEAD TO GROUND AND THE GAUGE SHOULD MOVE ONE WAY. THEN TAKE THE GROUND LEAD AND APPLY IT TO THE LEAD WHERE THE SENDING UNIT COMES IN AND THE GAUGE SHOULD MOVE THE OTHER WAY. IF THERE IS NO MOVEMENT THEN THE GAUGE IS NO GOOD. G.M. AMP OR BATTERY GAUGES: UNLIKE FORD OR MOPAR AMP, ALTERNATOR OR BATTERY GAUGES, G.M. AMP/BATTERY GAUGES ONLY SAMPLE CURRENT USING A PARALLEL VICE SERIES CIRCUIT TO INDICATE AMP. 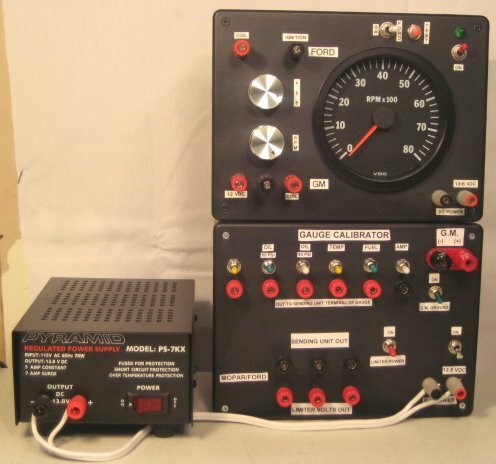 THE BEST WAY TO CHECK THESE GAUGES IS TOO USE A VOLT OHM METER AND USE THE R TIMES 1 SCALE AND CONNECT THE METER LEADS ACROSS THE 2 TERMINALS ON THE BACK. IF THE GAUGE IS GOOD YOU SHOULD READ AROUND .5 OHMS. THIS GOOD READING IS ONLY 90 PERCENT ACCURATE AS THE COIL WINDINGS ENAMEL COATING COULD BE DETERIORATING AND THUS NEED REPAIR IF YOU GET NO READING THEN THE WINDINGS ARE BURNED UP IN THE GAUGE AND IT NEEDS REWOUND. CALL H&H AUTO AT 864 895 4404 OR EMAIL US AT tachman@bellsouth.net AND WE WILL REPAIR AND CALIBRATE YOUR GAUGES WITH A 2 YEAR WARRANTY. NOTE: MANY GM ELECTRICAL GAUGES LOSE THEIR DAMPENING. IF THE NEEDLE ON YOUR TEMP, FUEL, AMP OR ELECTRIC OIL GAUGES CAN BE SPUN AROUND EASILY THEN IT HAS LOST IT'S DAMPENING FLUID. H&H HAS A SPECIAL TOOL THAT CAN RESTORE DAMPENING AND MAKE YOU GAUGE LIKE NEW! 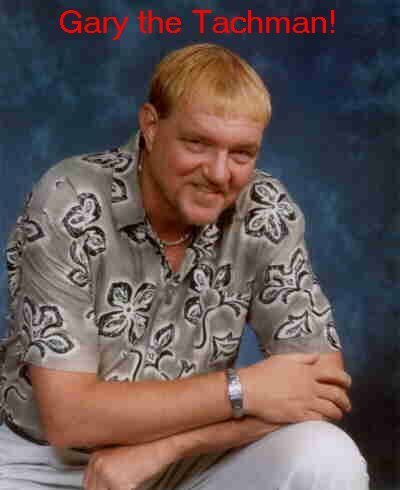 THERE IS NO SAFE WAY TO INSTRUCT YOU ON HOW TO CHECK MOPAR, G.M., OR SUN TACHOMETERS. THE BEST WAY IS SEND YOUR TACHOMETER TO H&H FOR A FREE EVALUATION. WE CAN UPDATE THESE TACHS TO MODERN ELECTRONICS AND CONVERT CORVETTE MECHANICAL TACHS TO ELECTRONIC! 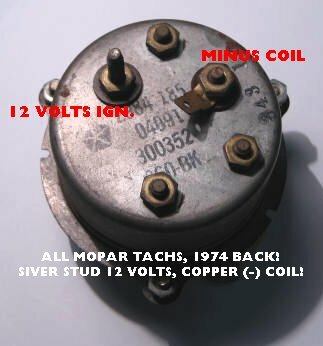 1968-1974 Mopar AND 1971-1974 AMC TACHOMETERS. Mopar tachometers were produced by Stewart Warner. In there design Stewart Warner utilizes a super duty 20 milliamp meter movement(unit that moves to indicate rpm. In comparison, Ford utilizes a 500 microamp meter movement and General Motors utilizes a 1 millamp meter movement. This means it takes 20 times more current to deflect a Mopar tachometer than a General Motors tachometer which utilizes a 1millamp tachometer movment. Mopar meter movements are super duty and very rarely defective. However, the Mopar (Stewart Warener) meter movement is slower to react. The response time is slower, but usually accurate. Example: Mopar meter movement takes more time to come off zero to 1000 rpm’s. This is inherent to the design of the Mopar tachometer. When Tachman converts your Mopar tachometer to our modern tachometer electronic circuit, it improves reliability. Mopar tachometers will not work with many of the electronic ignition systems on the market and Tachman’s electronic circuit allows operation with these modern ignition systems. Hope this helps your understanding of the Stewart Warner designed 1968-1974 Mopar and the 1971-1974 American Motors tachometers. THE ABOVE PICTURE SHOWS HOW TO PROPERLY ATTACH YOUR 12 VOLT IGNITION AND COIL PICKUP LEADS ON A 1968- 1974 MOPAR TACHOMETER. THE SILVER STUD IS 12 VOLTS IGNITION AND THE COPPER LEAD (MOST LIKELY WILL HAVE A WIRE CLIP ON IT AS PICTURED) GOES TO THE MINUS SIDE OF THE COIL OR TACH SENDER. FAILURE TO HOOK THESE WIRES UP CORRECTLY WILL BLOW A FUSE IN MY SOLID STATE REPLACEMENT BOARD PICTURED ON THE MOPAR PAGE. I ALWAYS ATTACH A LABEL TO ALL TACHS WE SERVICE THAT WILL MAKE SURE YOUR TACH LEADS ARE CONNECTED PROPERLY! THE TACHMAN AT H&H AUTO PROVIDES OUR CLIENTS WITH THE BEST INSTRUMENT EVALUATION, TECHNICAL ASSISTANCE AND FOLLOW UP IN THE INSTRUMENT. RESTORATION INDUSTRY. VIEW OUR COMMENTS PAGE BY CLICKING HERE AND SEE OVER 409 YEARS OF SATISFIED CLIENTS. TACHMAN HAS STATE OF THE ART TACHOMETER, SPEEDOMETER AND GAUGE CALIBRATION EQUIPMENT THAT INSURES YOUR INSTRUMENTS ARE PROPERLY CALIBRATED!